I really dislike software bugs. 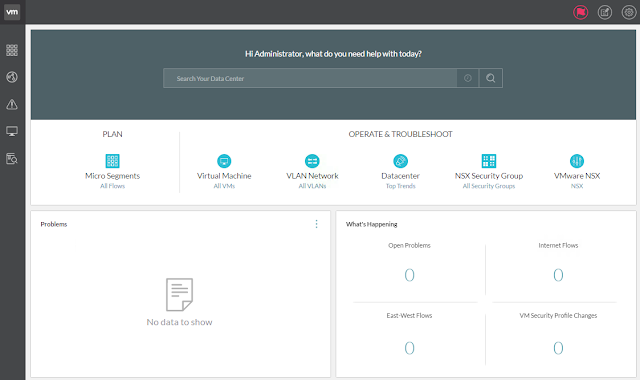 I spent hours trying to deploy the ova for vRealize Network Insight Platform to only have vCenter tell me that the operation was cancelled by a user. Forgive me, but last I checked I wasn’t hacked so there is no other user, I’m THE ONLY USER in my lab and I'm not cancelling the operation. Thank god that vSphere 6.5 will have actionable logs. Any way, after updating vCenter 6 from U1 to U2 and reinstalling the client integration plugin I was able to deploy vRNI Platform 3.1. I’m not going cover how to deploy an ova but to deploy vRNI Platform you will need a static IP and all the goodness that comes with it. Oh, and you will also need to know if you want to deploy the appliance medium size or large size. Regardless of the size, the size on disk can be substantial (even thin provisioned I think the thing is still big). You can go here to get the official instructions on how to install it. After deploying vRNI31 (that’s what I named the Platform), I couldn’t ping the thing. Turns out that for whatever reason the network information was not populated in the appliance (the boot logs showed “configure virtual network devices” failed). When I opened the console of vRNI31 to reach the CLI I discovered that I needed a username/password to get in (of course I would need one). The default credentials of admin@local/admin didn’t work, nor every permutation of root and admin I could think of (I’m a terrible hacker). So I decided to just walk away from the laptop and come back later. When I returned I remembered that there is a CLI Guide for vRNI and in it was the CLI credential of consoleuser/ark1nc0ns0l3 (which made me wonder how long before they change the password to vmw@arec0ns0l3). In the CLI I typed setup and re-entered the network information I provided during the ova deployment and presto. I was now able to reach the Platform’s login page, https://vRNI31/ (I updated my lab DNS server), to proceed with the installation. As you can see from the above figure, you need a license key to do anything with vRNI. Enter the license key and press Validate, followed by Activate. Of course, if the key can’t be validated you will be told the key is invalid. After activation, you get this window below. 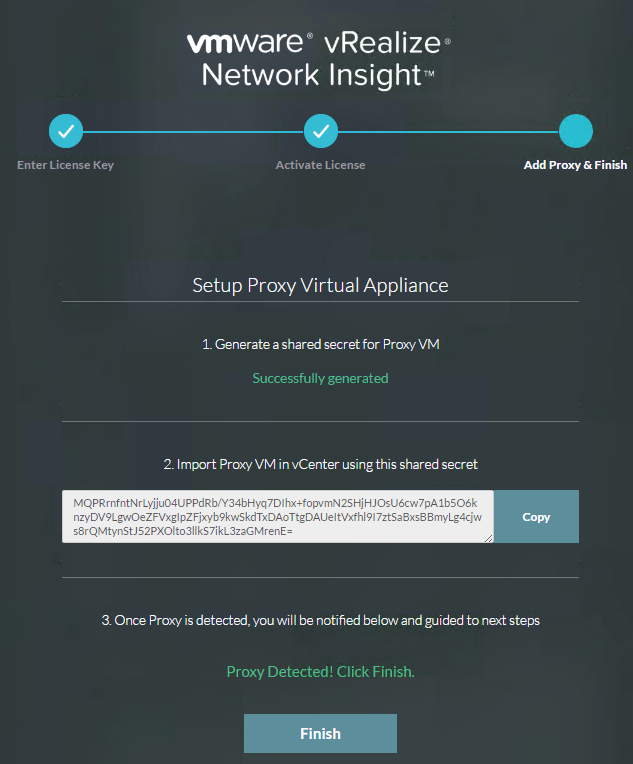 Here you need to create a secret key (by pressing Generate) that will be used to establish communications with the vRNI Proxy. Before continuing I probably should take a paragraph or two to do a high-level explanation of what vRNI is. vRealize Network Infrastructure is a product (since renamed) VMware acquired by buying a company named Arkin. vRNI helps Operations and Security teams manage and troubleshoot some virtual (vSphere and NSX) and physical Networks and Security. vRNI has a descent list of vendors and devices that it supports. 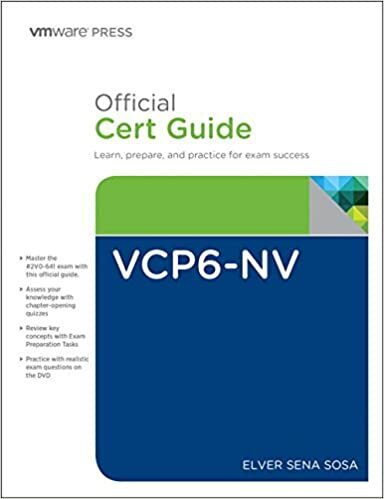 vRNI works by polling the sources (vCenter or Cisco UCS for example) every so often (defaults to 10 minutes) and using some jujitsu white magic to help identify issues that might exist in the environment (like a host with a misconfigured MTU for example). vRNI comes as two appliances, Platform and Proxy. The first one you install, which I installed above, is the Platform. The Platform does all the computations and smart stuff. The second one (which is what I’m installing next) is the Proxy, the one that does the data polling (and can be configured as a IPFix collector). vRNI supports some scalability by allowing you to cluster multiple Platforms and Proxies. I’ll cover in subsequent posts some of the things vRNI can help you do but for now, back to installing the Proxy. 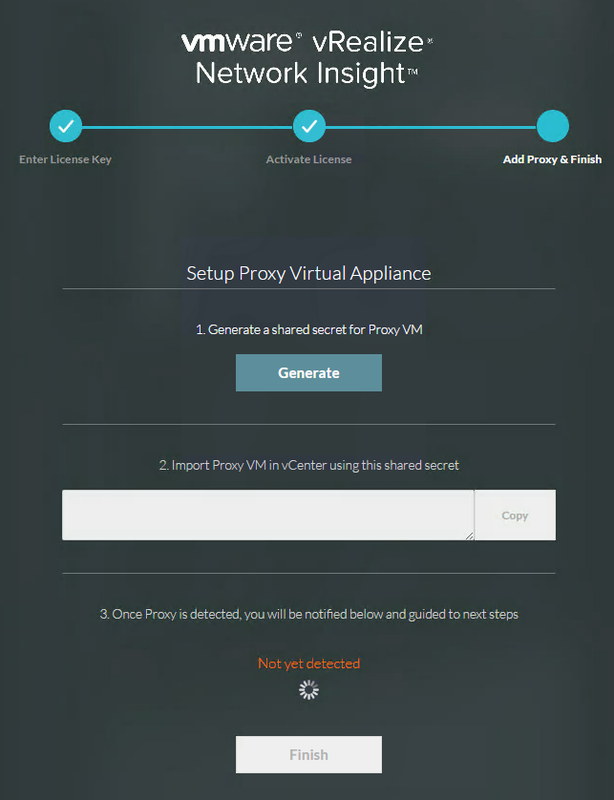 vRNI Proxy is the second ova that you need for vRNI to work. The only differences between deploying the Platform and Proxy appliances are the shared secret (in the Proxy), the definition of medium and large, and the size of the disk. Sure enough, a few seconds after adding the shared secret, the Proxy reached out to the Platform and was detected by it. Back in Platform login page (https://vRNI31/), I clicked finished and I was prompted to enter the login credentials (admin@local/admin), where it sent me to the vRNI home page. I’ll do my very best to write a follow up soon with a post(s) on how to add data sources and what to do with the information gathered. In the mean time, ta ta for now. 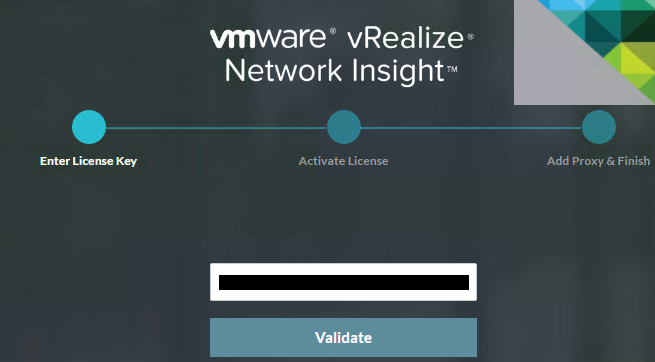 Elver’s Opinion: For a while VMware tried to position vRealize Log Insight as a Network and Security operations tool, but it is not. vRLI was built primarily to handle virtual compute, not Network and Security. As much lipstick as VMware put on it (via Management Packs), it just wasn’t enough. vRNI is by no means the ultimate N&S operations tool but it is way better than vRLI ever was for the job. ...does not work für vRNI v3.4.